Heritage Gardeners offer a $1,000 scholarship to a local high school graduating senior or to a local Texas College student with a college major of horticulture, floriculture, landscape design or other related studies who completes the application process and is selected as the scholarship recipient. Clear Brook, Friendswood and other local high school seniors should contact their school counselor for a Heritage Gardeners Scholarship Application. Applications are due in March 2019. 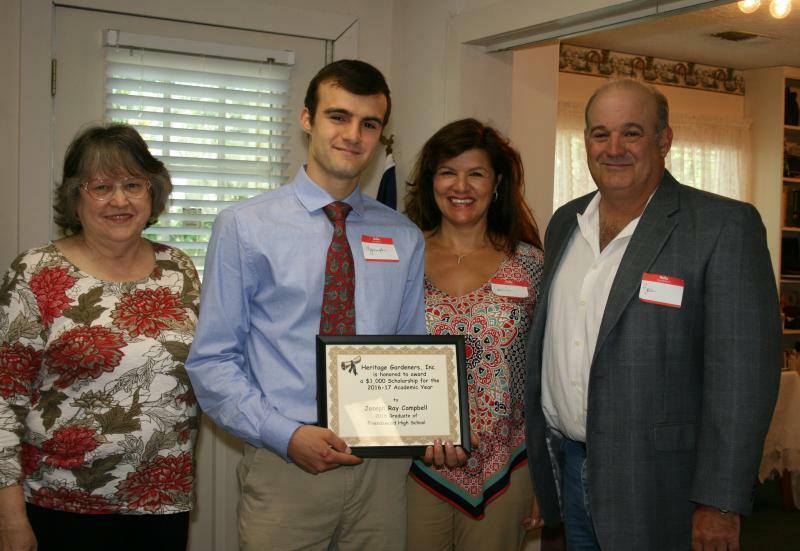 Heritage Gardeners scholarship recipient for 2016 was Joseph Ray Campbell from Friendswood High School. Scholarship chair Roseanne Malone, pictured left, presents Joseph with his scholarship award along with his parents Donna and Joe Campbell. Joseph and his parents were honored at our May 5, 2016 luncheon.